Presidential and State Primary Election Day. (SDCL 12-2-1) South Dakota has a closed presidential and state primary election. The South Dakota Democratic Party does allow voters registered as no party affiliation/independent to vote in their primary election. The Libertarian Party of South Dakota does allow voters registered as no party affiliation/independent to vote in their primary election. SDCL 12-5-3.8 provides "If a political party chooses to have a primary for selection of its delegates and alternates to the national convention, the party shall certify the candidate names or the delegate and alternate slates which are to be listed on the primary ballot to the secretary of state by the last Tuesday in March preceding the primary by five p.m. central time. 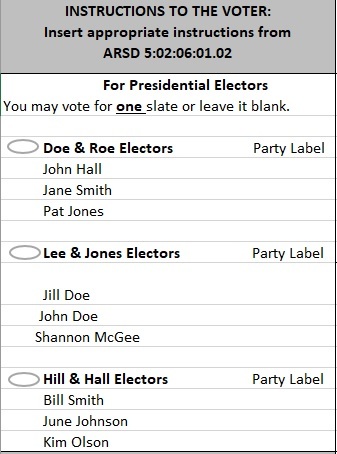 Only candidates or slates certified may be placed on the ballot by the secretary of state and the position of the candidates or slates on the primary ballot shall be chosen by lot by the secretary of state. The certification shall be deemed to be submitted if mailed by registered mail by five p.m. central time on the last Tuesday in March. If a political party does not choose to have a primary selection of its delegates and alternates to the national convention, the party shall define the selection process of its delegates and alternates in the party bylaws." SDCL 12-5-3.14 provides "Any candidate, committee, or group supporting a candidate in any presidential primary, shall, by the last Tuesday in March prior to the presidential primary election, notify the Secretary of State of an intention to have the name of the candidate placed on the presidential primary election ballot or submit a slate of candidates or both." A political party may become a recognized party by filing the appropriate new party formation petitions containing 3,392 signatures of registered South Dakota voters (SDCL 12-5-1). These petitions must be filed by March 31, 2020. A recognized party would adopt their own procedures on how to select delegates to their national convention and would have their own party column on the general election ballot. Independent candidates for president may be on the general election ballot by petition. Any person interested in becoming a candidate must file a certification with the Secretary of State indicating the name of the candidate's vice-presidential running mate prior to circulating petitions to put the names of the presidential electors on the general election ballot (SDCL 12-7-7). The petitions must contain signatures of 3,392 registered South Dakota voters. Petitions may be circulated beginning on January 1, 2020, and filed between January 1, 2020 and August 4, 2020, with the Secretary of State. Petition and certification forms are prescribed by the State Board of Elections and are available from the Secretary of State's Office. 5:02:08:05.01. Independent candidate declaration of candidacy and certification of running mate. Write-in votes are not allowed. South Dakota does not assess a filing fee for presidential candidates. There are no separate campaign finance reporting requirements at the state level for federal candidates. South Dakota has three electoral votes. A presidential candidate must submit a letter of intent (on his/her campaign letterhead including the signature of the candidate) by the filing deadline. The state political party must also certify that candidate and a slate of delegates for that candidate by the filing deadline. The presidential primary candidates are listed on the primary election ballot along with a slate of delegates & alternates (which are certified to our office from the state political party) for that candidate. The slate of delegates & alternates that receives the most votes are elected as the winner. The presidential primary races are really just electing the slate of delegates & alternates that will attend the national convention to vote for that party’s candidate to be certified by the national political party as the party candidate for the general election. So you will see the candidate names on the primary ballot and you mark the candidate of your choice, but you are really voting for the slate of delegates listed for that candidate. The national political party will determine which candidate will be certified to the states as their party candidate for the general election (only one candidate per party can be certified). The national political party will certify the name of the candidate to the Secretary of State. The state convention shall nominate candidates for presidential electors. The general election ballot will list the name of the presidential candidate along with his/her vice president and underneath those names it will state “electors.” The candidate that is elected will allow those three electors to meet in the Governor’s Office on the date directed by the United States Congress to perform their duties of casting South Dakota’s three electoral votes for that party’s presidential/vice presidential candidates. 12-24-1. Elector's notice to Governor of readiness to perform duties--Certificate of names presented to electors. Each elector of President and vice president of the United States shall, before the hour of eleven o'clock in the morning of the day fixed by the act of Congress to elect a President and vice president, give notice to the Governor that he is at the seat of government and ready at the proper time to perform the duties of an elector; and the Governor shall forthwith deliver to the electors present a certificate of all the names of the electors. 12-24-2. Replacement of elector failing to appear. If any elector named in the Governor's certificate fails to appear before nine o'clock in the morning of the day of election of President and vice president as aforesaid, the electors there present shall immediately proceed to elect by ballot, in the presence of the Governor, a person to fill such vacancy. If more than one person voted for to fill such vacancy shall have the highest and an equal number of votes, the Governor, in the presence of the electors attending, shall decide by lot which of such persons shall be elected. 12-24-3. Notice to and powers of elector chosen to fill vacancy. Immediately after such choice is made, the name of the person so chosen shall forthwith be certified to the Governor by the electors making such choice; and the Governor shall cause notice to be immediately given, in writing, to the elector chosen to fill such vacancy; and the person so chosen shall be an elector and shall meet the other electors at the same time and place, and then and there discharge all and singular the duties enjoined upon him as an elector by the Constitution and laws of the United States and of this state. 12-24-4. Time and place of performance of constitutional duties by electors. The electors of President and vice president shall, at twelve noon on the day which is or may be directed by the Congress of the United States, meet at the seat of government of this state and then and there perform the duties enjoined upon them by the Constitution and laws of the United States. 12-24-5. Compensation and mileage of electors. The electors shall receive the same compensation per diem and the same mileage as members of the Legislature. After the presidential election, your governor prepares a “Certificate of Ascertainment” listing all of the candidates who ran for President in your state along with the names of their respective electors. The Certificate of Ascertainment also declares the winning presidential candidate in your state and shows which electors will represent your state at the meeting of the electors in December of the election year. Your state’s Certificates of Ascertainments are sent to the Congress and the National Archives as part of the official records of the presidential election. See the key upcoming election dates and information about the roles and responsibilities of state officials, the Office of the Federal Register and the National Archives and Records Administration (NARA), and the Congress in the Electoral College process. The meeting of the electors takes place on the first Monday after the second Wednesday in December after the presidential election. The electors meet in their respective states, where they cast their votes for President and Vice President on separate ballots. Your state’s electors’ votes are recorded on a “Certificate of Vote,” which is prepared at the meeting by the electors. Your state’s Certificates of Votes are sent to the Congress and the National Archives as part of the official records of the presidential election. See the key upcoming election dates and information about the roles and responsibilities of state officials and the Congress in the Electoral College process. Each state’s electoral votes are counted in a joint session of Congress on the 6th of January in the year following the meeting of the electors. Members of the House and Senate meet in the House chamber to conduct the official tally of electoral votes. (On December 28, 2012, President Obama signed Pub.L. 112-228, as passed by both houses of Congress, moving the day of the vote count from January 6, 2013 (a Sunday) to January 4, 2013.) See the key upcoming election dates and information about the role and responsibilities of Congress in the Electoral College process. Electoral votes are allocated based on the Census. The allocations below are based on the 2010 Census. They are effective for the 2012, 2016, and 2020 presidential elections.